On March 24, 2013, the MidStates Football League (MSFL) announced the 2013 schedule. The season will kick off the second weekend in July. The Indiana Mustangs will start the season on their home turf, St. Vincent Health Field at Marian University in Indianapolis; that game will be against the Chicago Mustangs. 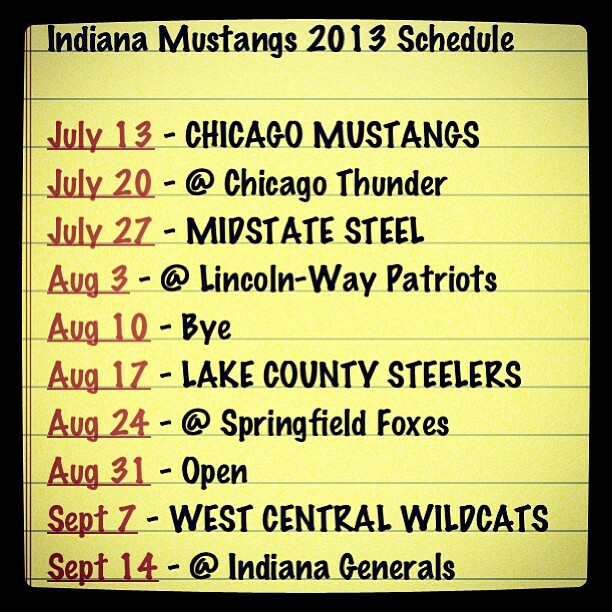 The Indiana Mustangs will play 5 of their 8 regular season games in Indianapolis. The fifth game happens to be the final game of the regular season and it will be against the Indiana Generals; an away game for the Mustangs but one where they feel that they have ability to win against their in-town host rival. The furthest the Mustangs will be traveling is Springfild, IL to take on the Foxes. Come support your Indiana Mustangs at St. Vincent Health Field. There will be plenty of entertainment both on and off of the field. The team plans to have fun surprises for everyone to participate. Fans will also get a chance to meet the players, coaches, and staff.